Oh…and the location – the end of the world! The Course: 6 loops end-to-end through snow, mud, rocks, hills, and ever changing winds off the coast. The Spectators: Some friendly penguins, my fellow runners and the race and expedition staff. When you come this far, there is only one acceptable result: finish, capture plenty of video and photos for the cause, and enjoy every moment. With a combined 11 layers on my body, I crossed the 2016 Antarctica Marathon start line with 101 of my fellow runners. To my left, three penguins perplexingly stared at us humans about to embark on 26.2 miles ahead. The first mile ran past a couple of research bases, wrapped around an inclined hill leading along a muddy path which merged into a larger hill. As I approached mile 1.2, I left one of my water bottles in the “drop zone,” because there are no water stations in this race. You leave your drinks of choice at the start/finish line and you drop whatever you want off in this area. research base in the distance. Turn around!? In most races, you run from point A to point B where everything is fresh and nothing is repeated. I don’t like knowing what is ahead of me, and psychologically, this race was the exact opposite. I ran back through the rocks, up the now ascending 500 foot hill, past the water bottle drop off and back to the starting line. I removed three layers, sipped some chilled Gatorade and proceeded out for the start of loop two. Loops two and three were not as easy as loop one. The sun vanished and the wind fluctuated between 10-25 mph. Being totally exposed to the elements, I focused my attention and energy on completing loop two, added a layer since the temperature dropped by 10 degrees, sipped some Gatorade and proceeded on the same exact route I had run twice beforehand. he course began to get more treacherous with every additional mile as I trekked from the thick mud toward the slippery uneven rocks. The halfway cut-off time of 3 hrs 10 mins was deeply branded in every single marathoners mind. I talked about it on the plane from the U.S. to Argentina with a stranger (thank you kind sir for putting up with me), at the banquet dinner in Buenos Aires, at breakfast, lunch and dinner on the Drake Passage, with the staff and possibly even a penguin or two. With the weather being so unpredictable, I was not going to take any chances. Loop three took my mind away from the elements on the ground and I focused my attention on the extraordinary glaciers in the distance along with majestically floating patches of ice in the foreground. The skies were getting thicker with cloud coverage and the winds were clearly picking up and smacking our bodies around like penguins running away from fur seals. As I approached the start/finish line, I breathed a big sigh of relief: 13.1 miles in the books in 2 hrs 30 mins. Two more layers were added to my body. The backend of a marathon is never easy. Between flying halfway around the world, having a queasy stomach (cheers Drake Passage), running 13.1 miles thus far and knowing the weather conditions would not improve, I couldn’t have been in a more ideal situation. A family of penguins takes notice of us runners. To be fair, during these two hours, I refused to let any type of doubt creep into my mind. I literally mumbled 300+ times during this race “You know, you are never coming back to run this race again, right?” A good number of people already dropped down from the full marathon to the half. My body wanted to pause at times, but my mind refused. I knew pausing meant slowing down. Slowing down meant my body temperature dropping. My body temperature dropping meant I might not run the pace I needed which mentally would lead down a treacherous road. I kept my head down and my mind focused on loop six which ended up being the sweetest 4.37 miles of my life! My feet were sore, my face was cold, I had ALL my layers on and approximately 23,000 steps was between me and the finish line. Being on this continent allowed me to run alongside some of the best runners on the globe in a place that fewer than 2,000 people have ever attempted to run a race. For crying out loud, this is Antarctica! A place that offers endless panoramic views of glaciers, floating icebergs, penguins, seals, whales, picture perfect sunsets and sunrises and the purest form of escape. With all this floating around my head, I crossed the halfway point of loop six. As I made my way back toward the finish line, I stopped at mile 25 and began walking. I could have easily kept running, but I didn’t want this experience to end. I thought about how much transpired since I first started this journey in 2010 which has literally taken me all around the world. The goal initially was to figure out a way to raise dementia awareness and funds by running races. I needed a name, a website, a research partner and actual supporters to believe in this cause. And as I walked up to mile 26, I zen’d out on my back. Yes I sat down, closed my eyes all the while runners passed me by and asked if I was okay. I was more than okay. Five minutes later, I jumped to my feet and crossed that finish line with at 6:11:18 a tremendous sense of pride and accomplishment. What began as an idea has transformed into a living dream that has exceeded all my expectations. Of course, I wasn’t going to leave that continent without the most refreshing ice bath on the planet! 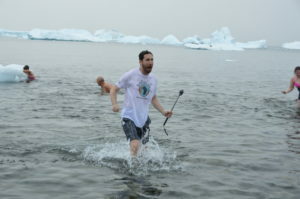 The coldest polar plunge on any continent – slightly above freezing. My answer: Athens, Greece of course! And what better venue then where the marathon originated to run my 7th continent for R4P. hi- i loved your synopsis of this event! i’m trying to read as much as i can about others’ experiences. i have a slot in the 2017 marathon and am very anxious about the terrain. i’ve been running for almost 33 years, done 2 marathons, numerous triathlons, and train year-round outdoors where i live- on the coast of maine. cold does not faze me, i’m building trail runs into my training but would welcome any other tips! i just want to finish. thank you in advance for any guidance you can provide!! So wonderful to hear from you and very excited about your upcoming trip in 2017! Sounds like you are doing everything you can to prep for the exciting marathon ahead of you. One of the most important things to remember is that the weather, wind and temperature changes frequently so it is not uncommon to swtich out different layers each and every time you run a loop. Similarly, there is no way to prepare for the unknown. I was on one ship and had met people on the other ship before we left Buenos Aires. We had some tough weather, but a day later, they had even worse weather and their race was cut short by 90 mintues. You just have to prepare for everything. I don’t want to scare you, I want to motivate you because it is going to be a trip and race of a lifetime!